I have a fabulous review & giveaway for you today lovelies! I recently was able to check out Vintage Modern Crochet by Robyn Chachula (ISBN: 978-1632501622, Interweave F+W). 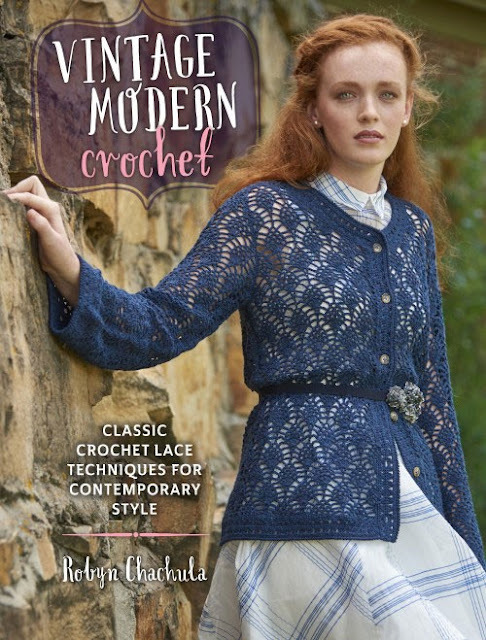 Vintage Modern Crochet is a lovely book filled with classic lacy crochet stitches and techniques that have been updated into modern styling. The book is divided into 5 different popular types of crochet lace, each with their own intro and background information too! Modern Vintage Crochet contains a wide variety of projects too like tunics, wraps, jewelry, cardigans, shawls, and more. The book is photographed in full color and complete with color-coded charts to make things extra helpful. At the end of the book each stitch used in the book both with a written explanation, plus a diagram. Other useful techniques like basic seaming, a metric conversion chart, and a table with all abbreviations used are included too...everything to make the projects all in one handy place! One of my favorite pieces from the book would definitely be the the tunic shown above. I love the classic, vintage stitches used, but it is styled in a very wearable modern look. I was also charmed by this fabulous wrap shown below, how much fun is that red? Check out the dimensional blossoms too...fantastic! Now is you chance to win a copy of your own! Enter to win using the Rafflecopter below (sometimes it takes a moment to load). Giveaway ends May 12 and is open worldwide. Now go, go, go, and enter!!! Can't wait? Need one right now? Click below to order one today! I love the pineapple motif, so the cover cardigan is right up my alley. The variety of shawl patterns is also a plus. I am in love with the first 2 sweaters that are pictured!!! Oh my goodness I love the wrap pattern & red is my favourite colour. Great giveaway. Love your videos. I love the gorgeous lilac cardigan in one of the above pictures. Perfect for spring or autumn as it is here in Australia currently. Having a hard time choosing which pattern to make. Everything appeals to me. I like the red shawl. The "café latte" tunic (light brown and white border) is my favourite pattern, i'd love to crochet it ! I just love the cardigans! So beautiful. Thanks for the giveaway ! I love the tunic that could be used as a beach cover-up. Looks like there are some goregous projects in this book! I need to get my hands on it! Thanks for the fabulouse giveaway! Those patterns look beautiful. First I love your site and the patterns you share, yours and others'! Also, thank you so much for this opportunity for a chance to win this AWESOME book of patterns!! I love the wrap too!I love the color of the one in the picture. Would love to win this book and make something for myself. Love the red wrap! Great giveaway! Thanks! I love that lilac cardigan!